GarageBand on the Run: Do you hear the people sing? Apple touts its GarageBand for iPad application as a great way to play and record music without the need to learn scales or time signatures. Musical newbies aren’t the only ones interested in using the $5 app, however. GarageBand for iPad appeals to seasoned musicians, too. And those with significant investments in recording equipment may be wondering which, if any, of their existing gear will work with the portable version of GarageBand. I decided to grab my trusty iPad, my iPad camera connection kit, and powered USB hub and plug in whatever I had around to see what would work. The iPad Camera Connection Kit includes two adapters that plug into the iPad’s Dock connector. 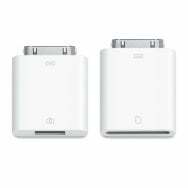 One of the adapters has an SD card slot that allows you to transfer photos and videos from a camera card into iMovie or iPhoto for iPad. The second adapter has a USB 2.0 input that allows you to connect a camera, or other USB peripheral to your iPad–I used one to connect a Flip camcorder. Whether peripherals work with the iPad or not depends on a number of factors. USB Class Devices (those that don’t require driver installation) and devices requiring little power are the most likely to work. For peripherals needing more juice, like the aforementioned Flash camcorder, a powered USB hub may be necessary to work with the iPad. The first thing I tried to connect was an M-Audio KeyStudio, a 49-key USB keyboard controller. It was recognized immediately when plugged into the USB port of the camera connection kit and didn’t require any external power. Once plugged in, I could use the 49 keys to control any of the many software instruments. Even the pitch and mod wheels onscreen responded when I turned them on the KeyStudio. Next, I tried a Blue Spark microphone. The Spark has a three-prong XLR connection, the standard for live performance and studio microphones. The easiest way to connect an XLR mic like the Blue Spark is with a USB converter and microphone preamp like the Blue Icicle which supplies the +48V Phantom power that condenser mics like the Blue Spark and the Rode NT1-A require. Plugging a USB cable from the Icicle directly into the iPad via the Camera Connection Kit caused iOS to issue a warning that “the attached accessory uses too much power.” Plugging the Icicle into my Belkin USB 2.0 7-Port Powered Hub and connecting the hub’s USB connector to the iPad Camera Connection Kit solved the problem, allowing me to record vocals using both condenser mics in GarageBand for iPad. Dynamic microphones, like the popular Shure SM58 don’t require Phantom power to operate, but the Icicle USB converter requires more power than is provided by the iPad’s dock connector, so I still needed to use the Belkin powered USB hub in order to use the SM58 to record into GarageBand for iPad. USB microphones don’t require an XLR to USB converter. The M-Audio Producer USB Microphone–part of the Avid Vocal Studio worked without a powered USB hub, but the Blue Yeti, did require the Belkin hub in order to use it to record vocals on the iPad. I also tried several desktop recording interfaces with the iPad. The M-Audio JamLab–an older, discontinued, USB guitar interface that features a single quarter-inch input from your guitar, worked flawlessly when connected via the Camera Connection Kit and the powered USB hub. The M-Audio Fast Track USB interface, part of the company’s Pro Tools Recording Studio has both quarter-inch guitar and XLR microphone inputs. Using the camera connection kit and the powered USB hub, I was able to record both guitar and vocals in GarageBand using the Fast Track. I had the same positive results recording guitar and vocals with the Avid Mbox mini. While I had a great deal of success connecting and using my input devices, not everyone has had the same experience. My colleague Chris Breen wasn’t able to get two products to play nice with his iPad–the Apogee One's built-in mic didn't work because you can't select it as an input in GarageBand for iPad and an old Edirol UA-700 didn't work at all. Chris was able to get his MIDI keyboard to work perfectly with GarageBand for iPad by using both an E-MU Xmidi 1x1 USB interface, available for around $30 on Amazon and the $200 Alesis IO Dock. This is great news for musicians with MIDI gear lacking USB ports. Have you had any luck, or lack of it, when attempting to use your Mac recording tools with GarageBand for iPad? If so, please post them in the comments section of this article. We’d love to hear from you.